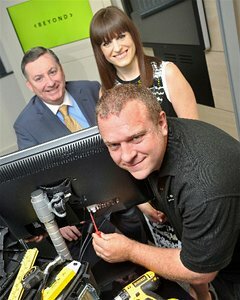 Councillor Ed Malcolm and Louise Richley, Manager Director of Beyond Digital Solutions with new employee and ex-servicemen David Boyd. South Tyneside businesses are reaping the benefits of employing ex military manpower as the Borough marks national Armed Forces Day (Saturday 28 June). Beyond Digital Solutions is just one of the local companies to recognise the advantages of having ex-military personnel in their workforce, following a 'Minefields and Motivation' event which was held for employers and showcased how the strengths and determination instilled into the variety of military roles can successfully transfer into civilian jobs. As a result of the event, the Boldon-based digital signage company recruited ex-Army officer David Boyd (36) as an Installation Engineer. David left the Army in December with more than 17 years experience in the forces. The married dad-of-four from Boldon Colliery said: "I left the Army feeling apprehensive about finding work. With the economy the way it was I knew the prospect of getting a job was not very good and I'd spent months sending out CVs without much success. I felt quite down-hearted about it all. "I initially applied for another job at Beyond Digital Solutions. And although this one wasn't quite right for me, they said I was ideal for a role they had as an Installation Engineer. I've done my training and I'm loving it. "It's great getting out of the house and going to work, and just being part of a team again, working together to get a job done is rewarding. It's also great to be back in the North East with my family." David most recently served as a Facilities Manager in London Central Garrison as second in command in the Royal Guardsrooms Administration Office, where he provided a liaison between the military and civilian contractors. He also served as an Infantry Soldier as well as made sure the correct equipment was ordered and available to troops when his battalion - the Coldstream Guards - was deployed to Iraq in 2005. The former St Joseph's RC Comprehensive School student also worked as a postman before joining the Army. Louise Richley, Managing Director of Beyond Digital Solutions, said: "The Minefields and Motivation event opened my eyes to the breadth of skills and experience gained in the military. The presentation was inspiring and made me realise that we value the same core values such as loyalty and problem solving. I was determined to explore this route to recruit an installation engineer. "For me, 17 years of service proved David's loyalty and I knew he would be reliable and hard working. His military background required David to check and maintain equipment, which is key for our role working in customer service sites across the UK fitting and servicing equipment. He also had essential knowledge of health and safety. David is now a highly valued member of our team." Councillor Ed Malcolm, Leader Member for Resources and Innovations at South Tyneside Council and the Borough's Champion for the Armed Forces, added: "We are delighted David has found work with Beyond Digital Solutions which recognised the abundance of skills and qualities that those in the military gain during their training and service. It is these skills that can bring a fresh approach to business. We wish David all the best in his new role." The 'Minefields and Motivation' event was hosted by South Tyneside Council in partnership with the South Tyneside Armed Forces Community Covenant Steering Group and aimed to help businesses understand how skills and knowledge gained in the forces can transfer into their workplace. It is just one of the many ways the Council is supporting serving and former military personnel, veterans, their families. The Council pledged its support back in December 2011 when it signed the official Armed Services Community Covenant - a voluntary statement of mutual support between the civilian and local armed forces communities. The Covenant encourages respect for the Armed Forces Community and aims to help provide easier access to public services, concessions and discounted private services. And South Tyneside's Armed Forces Forum, which was set up by the Council, works to make sure people in the forces community get the help and support they need as well as celebrates the Borough's strong tradition of military services. Supported by local regiments and the Ministry of Defence, the Forum raises awareness of the services community and the sacrifices they make through various events and displays. Ex forces personnel are also given a high priority rating in the Council's housing allocation system. Councillor Malcolm said: "We are very proud of our association with the Armed Forces community and recognise the sacrifices shown by our residents who have served in the military, and their families. "Our signing of the Community Covenant demonstrates our commitment to supporting them to deal with the pressures that they face and give them a helping hand to settle back into civilian life - whether this is finding a job, arranging a new school for children or finding a place to live. "Armed Forces Day offers us a great opportunity to celebrate the work we are doing to help those leaving military service and to support the wider Armed Forces community -serving personnel, veterans and their families, right across South Tyneside." This year, South Tyneside marked Armed Forces Day a week early with a special event held on Sunday 22 June. The celebrations included a military parade and open-air church service followed by an action-packed family fun day at Bents Park, South Shields. The event, featuring local uniformed military groups, bands and bugles, was organised by The Bad-Landers Motorcycle Club in conjunction with the Council to help raise awareness of the forces community as well as funds for military charities. South Tyneside Council has also recognised the Armed Forces in many other ways over the years. The 205 (3rd Durham Voluntary Artillery) Battery Royal Artillery Volunteers were given the Freedom of the Borough in 2007. For further information about support for the Armed Forces in South Tyneside visit www.southtyneside.info/armedforces or call South Tyneside Council's Customer Contact Centre on (0191) 427 7000 where staff can signpost to the relevant organisation or team.